Water running through the pipes. Cracks. Leaks, and water dripping. Water moving through the pipes, listen, drops. 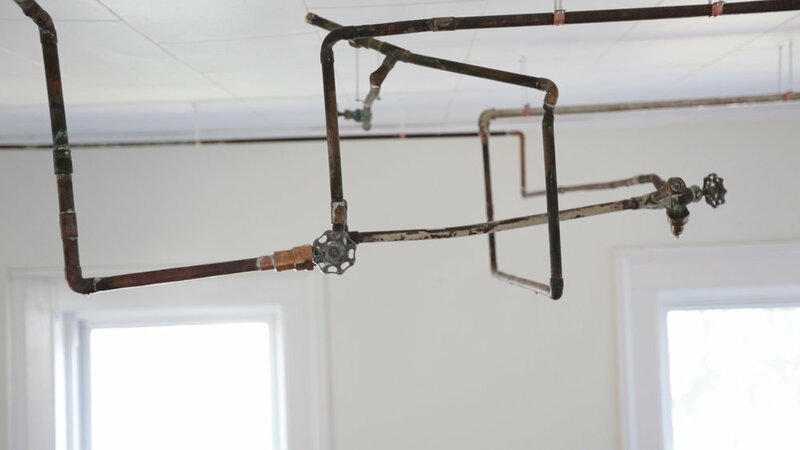 Rusted pipes against the white ceiling, rusted copper and steel, white walls. Rust, green, mold, and traces of cuts, of joints, of fluid silver now solid. Echo of drops in the room. The pipes were hidden in the walls of the house, were removed because defect, were stored in the basement. Now a visible structure in the room, with the room; a space that invites to listen, to look, to move.